Ventura High School’s Larrabee Stadium’s synthetic turf field may face challenges this October when the Environmental Protection Agency announces its findings on the relationship between artificial turf fields and health problems, including cancer. Artificial turf, or synthetic grass, has been the focus of an EPA-led investigation since 2016, following accusations that the “crumb” rubber pellets used to soften the fields contain carcinogens and other chemicals of potential danger. 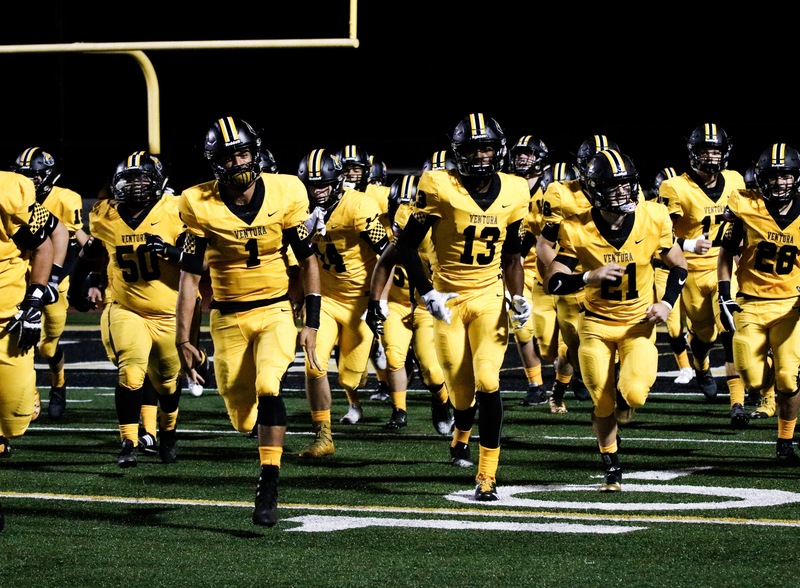 Communities like Ventura High School are unsure what a proven link between artificial turf and health problems will mean for their investments and the health of their kids. Larrabee’s original artificial turf was obtained from Calhoun, GA company FieldTurf USA, and installed between 2003 and 2004 at a cost of $580,000, according to FieldTurf’s website. A new field was installed in 2017. The Cougar Press reached out to athletic director David Hess and former Superintendent Trudy Arriaga for comment but has not yet received a response from either. Artificial turf was also installed at Buena High School, Ventura College and Harvard-Westlake High School; the Forest Hills, MD-based Synthetic Turf Council, an industry group says that there are over 12,000 artificial turf fields across the United States. However, artificial turf has been linked to health problems before. Governor Jerry Brown sued artificial turf producers as attorney general in 2008 for “excessive lead levels” in the paint used to color the plastic blades. Turf manufacturers settled, agreeing to lower the lead content of their products while replacing fields that could not be cleaned at no cost to the affected communities. While industry experts say that crumb rubber, made from recycling landfill-bound tires, is environmentally friendly, the results of a Yale University study conducted in 2015 by EHHI question that assertion. The study’s results identified 96 chemicals in crumb rubber. Of those, it identified 12 carcinogens and 20 skin, eye and respiratory irritants. Just under half of the 96 chemicals haven’t undergone toxicity assessments, meaning that their effect on human health is unknown. Field-goers are exposed to these chemicals when the crumb rubber “outgasses,” a term referring to the process where the pellets, heated by the sun to high temperatures, release their chemicals as gasses into the atmosphere. Wear and tear breaks down the pellets, creating dust that can be breathed, ingested or absorbed through skin. Of further concern is crumb rubber travelling off fields, presenting further potential challenges to human health and to Ventura’s environment. “Certainly you track it on your shoes and cleats,” said Jay Bolus, a chemist and president of certification services at environmental consulting firm MBDC in Charlottesville, Va.
FieldTurf, one of the industry leaders, has not yet responded to a request for comment by The Cougar Press. Their website, in a statement from October 2015, reminds readers that no causality, or direct links, exists between crumb rubber and health issues. The statement also says the company supports an EPA investigation. “In our view, scientific studies analyzed by independent third-parties that hold up under peer-review from qualified toxicologists are the best antidote for uncertainty,” says FieldTurf’s statement. Activists want the EPA investigation, which is being done with three other federal agencies, to provide a clear answer to the questions raised about artificial turf. However, some turf activists are concerned about the investigation’s scope. Lacking a set plan, independent actions are being taken in certain places. L.A, Unified School District banned crumb rubber in 2009, opting to use alternative infills. This year, San Mateo County’s Grand Jury has recommended the county’s schools stop using artificial turf until the EPA releases their study. “It would be a mistake for San Mateo County school districts to fail to consider such potential health risks as a part of their overall analysis of whether to use crumb rubber on its athletic field surfaces,” the Jury said. For VHS, what the EPA decides could have a big impact, especially if fields need be replaced as they were as a result of Brown’s lawsuit. All I can say is that the stuff stinks of rubber in the summer. I can understand why schools use this stuff (low maintenance, no mud, etc) but still — it stinks, and not a natural stink either.